The final day of the WSL Junior Qualifying Series (JQS) competition saw a repeat of Day 1 with 3-4ft (1.5 - 2m) waves for the best junior surfers from Australia, Japan and New Zealand. Gold Coast local Kai Tandler looked comfortable at home in the men's Final as he locked into a heat topping 8.50 (out of a possible 10) for his first wave with a radical three turn combo. 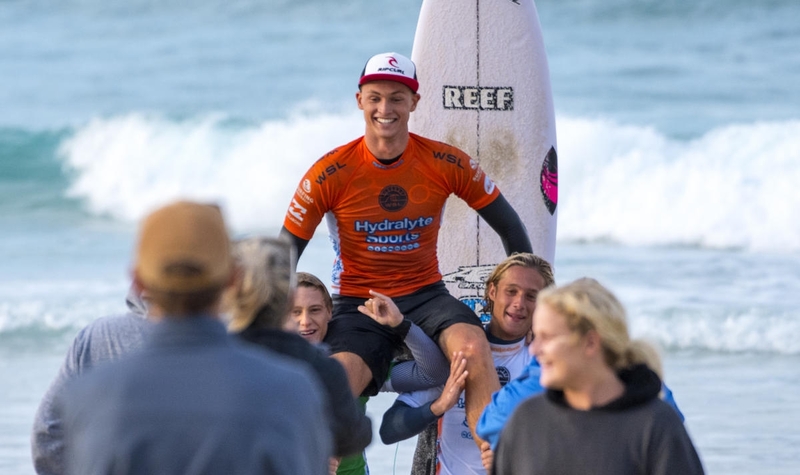 Tandler remained in front for the majority of the final and despite multiple attempts from Sunny Coast surfer Noah Stocca, was able to secure himself a back up score of 7.90 to claim victory. "It feels so good to get my first big win," Tandler said. "It's been such a sick weekend of waves and everyone has been surfing so good so I'm over the moon. I missed an event at the start of the year so have been playing catch up all season so this is a really important win, especially with the aim of making it to the Word Junior Championships. I have been building towards this result for the last few events so I'm hoping to carry this form into the next event in Cronulla." Prior to this weekend Tandler was sitting in ninth place on the WSL JQS series rankings, with today's result seeing him climb the leaderboard where he will sit alongside front-runners Callum Robson and Dextar Muskens.